(17/P38) TRENTON – The Department of Environmental Protection marks Air Quality Awareness Week the first week of May by encouraging residents to use common-sense measures to reduce pollution and improve air quality in their communities. Governor Christie has proclaimed May 1-5 as Air Quality Awareness Week in the Garden State, which focuses on education about air pollution and encourages residents to make changes in their daily routines that will positively impact air quality while also reducing impacts to human health and the environment. Some of those changes include combining automobile trips, keeping a vehicle’s maintenance up to date, using environmentally friendly cleaning products, not idling vehicles, and checking the state’s Air Quality Index (AQI) before heading outdoors. New Jersey’s air quality has improved significantly as a result of better pollution controls on cars, trucks and power plants. Also, consumer products now contain less volatile organic substances. Further, New Jersey has achieved the national standards set by the U.S. Environmental Protection Agency for fine particulate matter, but ozone air pollution remains a problem. While New Jersey has made significant progress in improving its air quality, more work is needed to meet federal ozone standards strengthened in 2015. Air Quality Awareness Week is timed to the start of ozone season, which begins as warmer weather approaches New Jersey. Ground-level ozone, also called smog, is a pollutant formed outdoors and is a problem for New Jersey and the northeastern United States. A strong respiratory irritant, smog can bring on asthma attacks and adversely affect the health of sensitive populations, such as those with respiratory and heart illness, older adults, young children, and people who are active outdoors. Consequently, residents are encouraged to protect themselves from the effects of smog. Turn off your vehicle’s engine while waiting in line. Do not idle your vehicle. 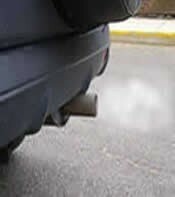 Eliminating idling will save fuel and money, and benefit public health. Develop good driving habits. Combine automobile trips to reduce “cold starts.” Choose a cleaner commute by carpooling, using public transportation, biking or walking when possible. When refueling vehicles, ask the station attendant to stop when the nozzle clicks off, to prevent overfilling. Tighten the gas cap securely. Refuel vehicles in the late afternoon or after dark to reduce evaporation of gasoline, a Volatile Organic Compound (VOC) capable of forming smog. Turn off lights when leaving a room. Turn off air conditioning and turn up the thermostat while away from home. Doing these three things can reduce pollution and save money. Before painting, lawn-mowing or doing other activities that cause air pollution, check the local forecast via the AQI at www.njaqinow.net/ If it’s a red or orange day, postpone projects involving solvents or engines. Clean and paint using products with low VOC content or none at all. Water-based products are best. Consider an electric vehicle when it’s time to purchase your next car. Visit www.drivegreen.nj.gov to assess affordability, find state and federal incentives, and learn about charging options. Everyone, especially those with health problems, is urged to check out DEP’s Air Monitoring Alert System. The system uses color codes to plan daily activities around current air quality conditions. Conditions are updated daily on the DEP’s Air Monitoring Web site, www.njaqinow.net/ Over exertion on days with poor air quality can be harmful to your health.